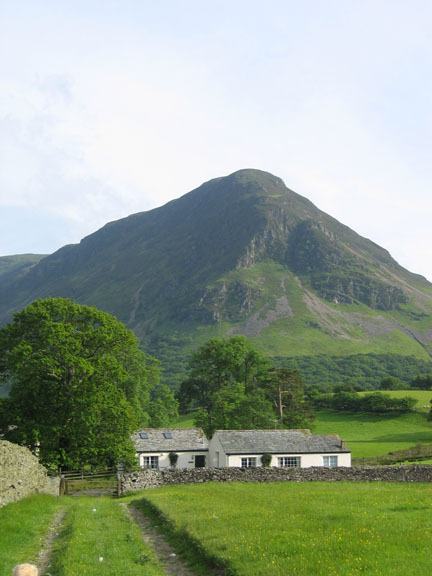 Date and place: Saturday 7th June 2003 Loweswater, Cumbria, Uk. 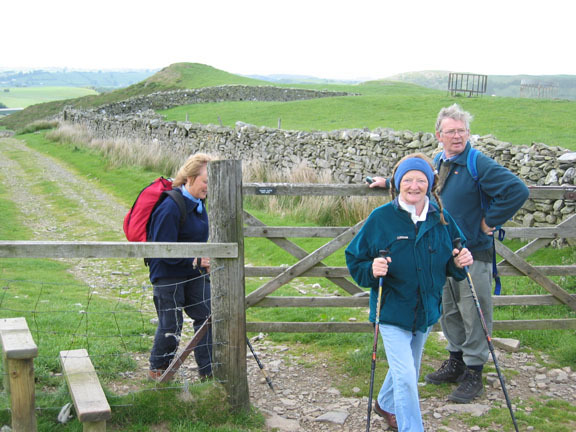 Event : A linear walk from Fangs Brow Farm to the cottage. With: Ann, Elizabeth and John, and the dogs. Distance and time : 4 miles, mainly downhill. A leisurely 2 3/4 hours. Weather : A fine afternoon but with distant lack of clarity. Starting on the high ground between Loweswater and Lamplough on the western edge of the Lakes high ground, we followed (in reverse) part of what is locally known as the Loweswater to St. Bees Coffin Road. Tradition has it that before our village had a church and graveyard, coffins were taken along this route, to the abbey at St. Bees, for Christian burial . 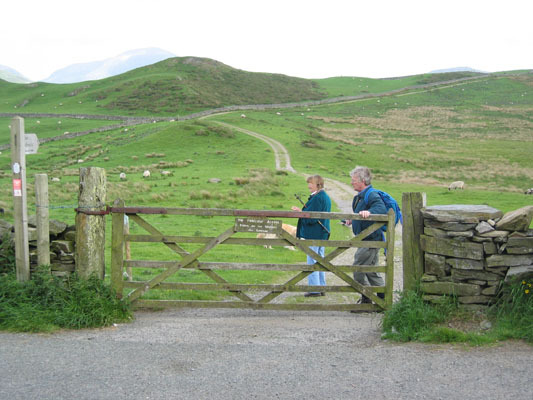 Similar old track ways are present in many parts of the lake, including the more well known one from Mardale (Haweswater) via Swindale to Shap Abbey. Hazy views back to the Solway, were too hazy for the camera to pick up today. Our friend Elizabeth and John at the second gate. Don't photograph me . . . look at that wonderful view behind you . 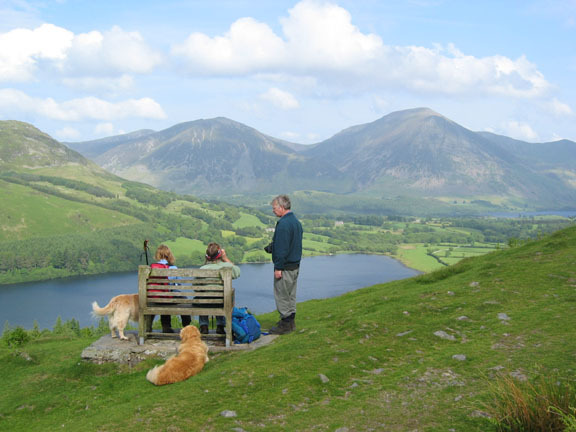 . .
Loweswater and the Buttermere Fells, Whiteside, Grasmoor and Mellbreak. A chair dedicated to a chap called Burrell. I don't know who he was, but he knew a good view when he saw one !! 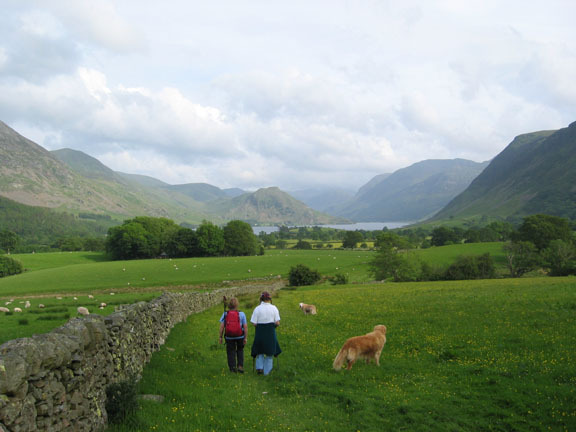 Crossing above Holme wood, we were getting closer views of Mellbreak and Crummock Water. High Nook Tarn. 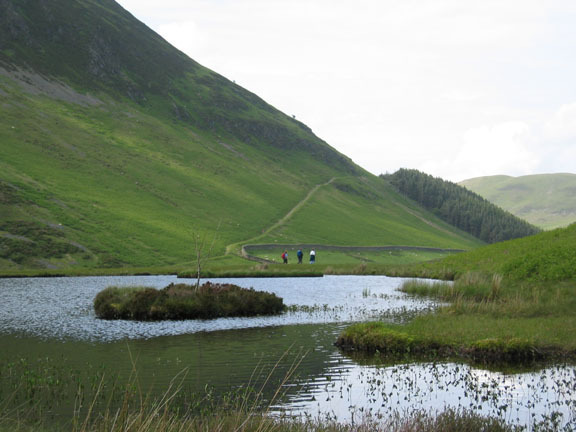 A shallow tarn below Carling Knott. 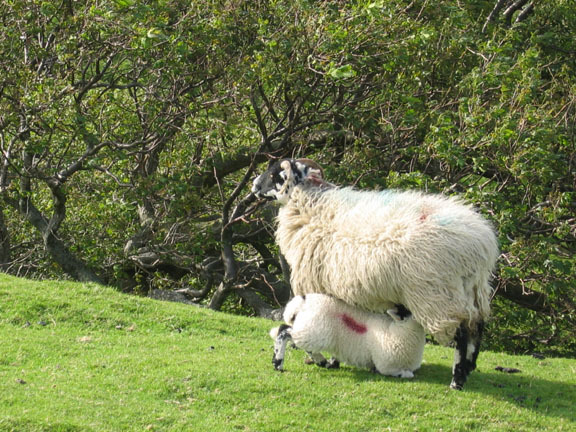 It is in the valley of, but surprisingly not fed by Hig Nook Beck, which rises on Blake Fell half a mile to the west. The lambs are getting much larger now - much to Mum's consternation. 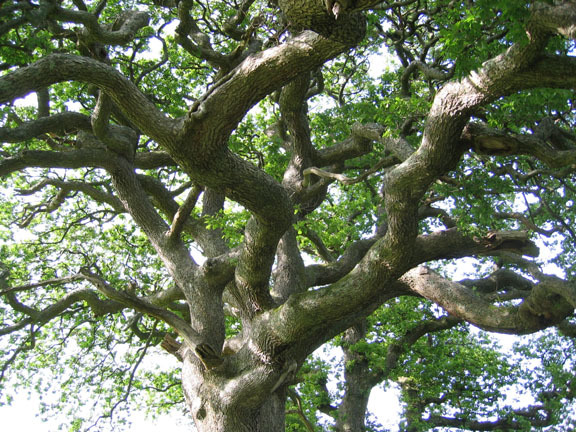 An impressive twisted Oak tree next to the Thackthwaite Road. From Foulsyke, we crossed the fields towards home. 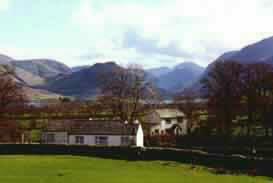 Here the view is of Crummock, Rannerdale, and the Buttermere Valley. Afternoon light on Mellbreak's northern crags. 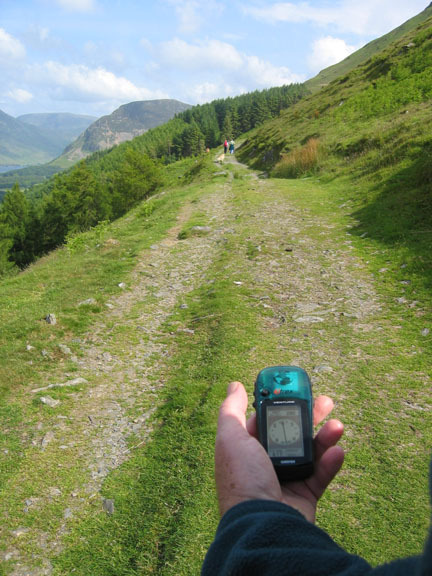 We experimented today with John's Gamin GPS and the Anquet Computerised OS.Map system. Whilst not really needing it for this type of walk and in this type of weather, it was nevertheless a very useful learning experience. The map shows our "track" in blue, starting when he switched the system on to the left of High Cross Farm. We drove up the lakeside, including a slight diversion to Askhill, and started the walk at the to left just south of Fangs Brow farm. The green line was our planned route, the blue the actual. 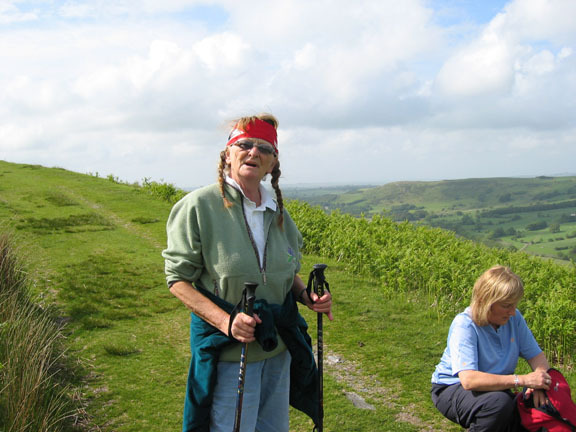 We walked south and east back to Loweswater. ("Route" and "track" coincided beautifully except at the end where we deliberately diverted off via Foulsyke) The second green line through Holme route was an alternative walk, which only serves to complicate this picture - sorry about that !! 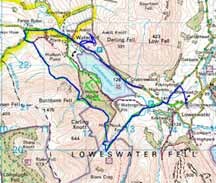 This was a very interesting exercise, not only in walking with the GPS, but also planning and downloading the route, and backloading the final walked path (track) afterwards. The map section was a sreen print, cut and pasted into photoshop. This site best viewed . . . with a computer.